A little super hero getting his own BIG film? As Marvel revealed it’s second summer blockbuster for the season, I was expecting Ant-Man to be the “B” movie to Avengers: Age of Ultron. I mean seriously, Ant-Man was a bit of the super hero “nerd” in the comic books. 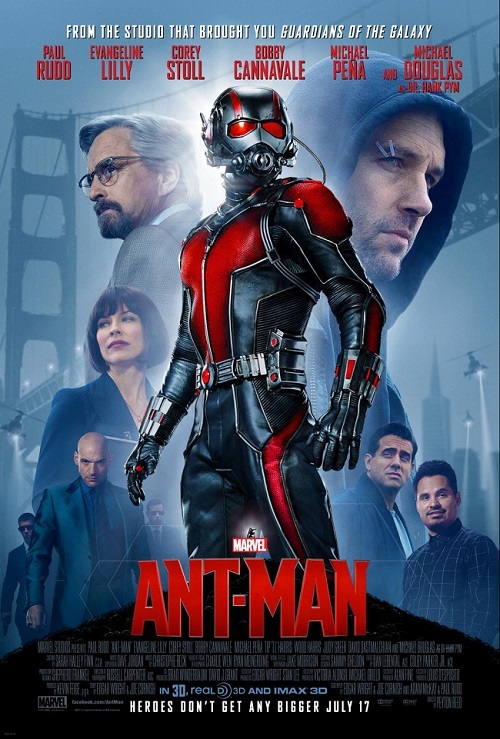 But as we dive into this Ant-Man movie review, I the skeptical mom am proud to use the old saying that “good things come in small packages.” So check out the mom’s view of the Marvel Ant-Man movie, including if it’s safe for your kids to see. Unlike most Marvel films, there’s not 5 million conversations, unspoken tensions and comic book lingo flying over your head in the midst of nonstop action. You don’t have to be a die hard Marvel fan to be able to sit back, relax and enjoy this movie. 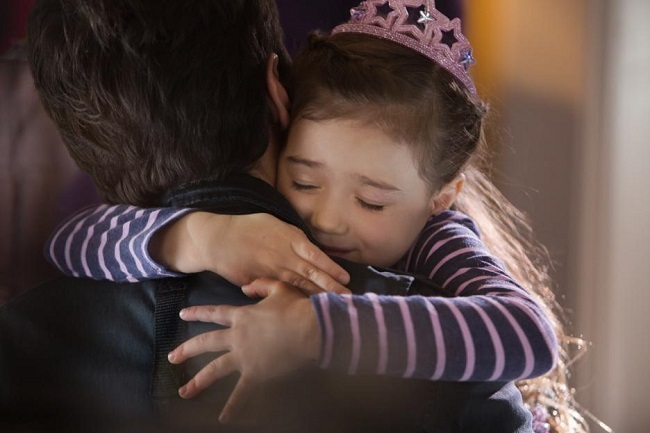 Ant-Man doesn’t contain an overly complicated plot, pretty easy for kids even to follow. There’s enough comic relief in there to get everyone laughing throughout as well. A super hero that wasn’t a super hero, you really get a different side of Marvel with Paul Rudd in the lead. He’s quirky. He’s awkward. He’s kind of goofy. But he also has some fantastic lines. 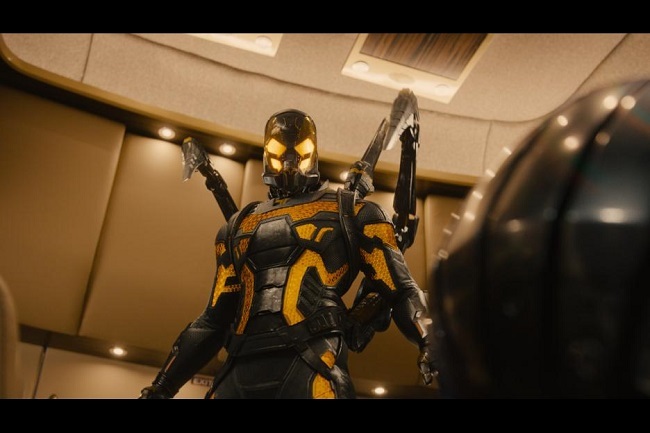 Eventually “growing” into his role, the inevitable save the world from the destruction of The Yellow Jacket earns him a role in Marvel history. I was actually really good with my 6 year old son seeing this movie, until the blatant swearings were added. The s-h-*-t word comes into play a few times, and not just in passing conversation but as the punchline. I didn’t see this film as “moderate bad language” per se, but I counted at least 3-4 swear words that I WOULD mind my son repeating. So parents, you may want to screen before taking kids under the recommended 13 year old age. While there is violence including guns, I didn’t see grotesque bloody action that would have my eyes cringing while my son watched. I think he would have been able to handle that. And with the easy to follow plot and humor, he definitely would have gotten a kick out of the shrunken scenes. I got the warm fuzzies about Honey, I Shrunk the Kids. Remember that film, parents? I would think an 8-10 year old that loves super heroes would be able to handle this Marvel movie. It is definitely the “tamest” of the intense violence films you see from Marvel. I would watch this film again, in the theaters. I wouldn’t waste your time on 3D IMAX, it wasn’t impressive. 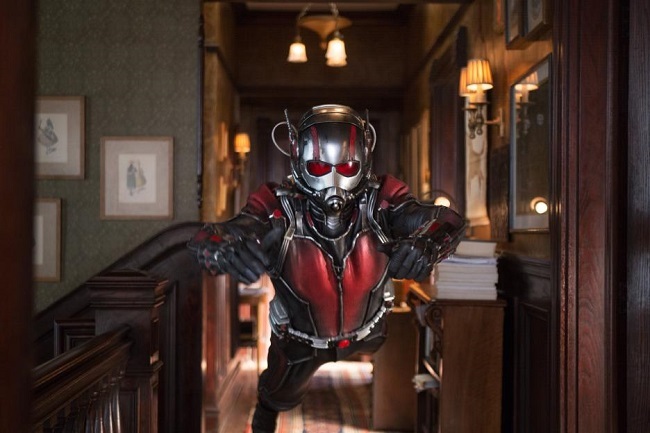 But the story, the action, Paul Rudd…I became an Ant-Man believer. So I take it back, Marvel. It was an entertaining movie. The recurring theme of the importance of a father/daughter relationship is really touching. I love when super heroes have a soft side. 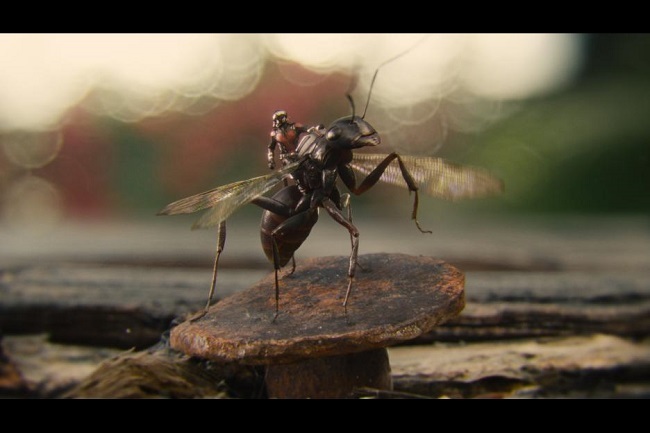 And the cinematography for the shrinking of Ant-Man and the magnified world was rather impressive. And hey, I even learned a thing or two about ants (in case you needed an education angle). The fighting scenes with Yellow Jacket in the daughter’s room and the briefcase were the most impressive in my opinion. Definitely of Marvel caliber. And a few tie ins to other Marvel films was fun as well. In fact, my husband and I are already talking date night to see this film. So maybe leave the kids at home with a sitter and head into theaters this summer for a surprising and entertaining “A” movie from Marvel. And I cannot emphasize enough. Stay until the very very very last moment of the movie. Not one but two teasers that you won’t want to miss. I promise. 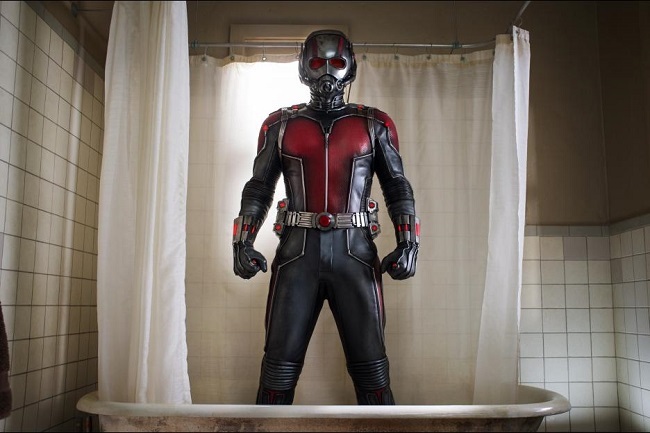 Will you be seeing the latest Marvel movie, Ant-Man, in theaters now? I received a free advanced press screening of this film in exchange for this review. All opinions are my own. Be sure to follow Saving Said Simply via Facebook, Twitter, Google, Instagram, Pinterest and YouTube for more movie reviews, happenings and releases! I love this Character so different for a Super Hero. I like that it is kid friendly. My Grand Son Loves that the Marvel Characters as well. Thanks for the review. I wasn’t sure if I was going to take my children, but from your review I think they will be fine. We are die hard Marvel fans in my house, but I wasn’t sure if this would live up to the the Avengers, but from your comments it seems it will. Thanks! Thanks for the review, my son is six and I try to shield him from swearing so I doubt I would take my son. I will not be seeing it in the theaters but will definitely Redbox it!! Its just not our type of movie! But it sounds great and worth watching so we will definitely make sure to see it!! My husband and I are excited to see this, but my son won’t be watching it. It’s tough because so many of the superhero-like movies are appealing to kids. I just feel like a lot of them have some violent scenes that kids end up acting out or mimicking. Could be worse, but I don’t love it. it seems ok for the kids..
kids love super heros, so what a little violence isn’t that bad, in my opinion. Thanks for a great review! I’d feel comfortable now taking my 10 year old sister. My son i s dying to see this, I think at 11 he is old enough. I’m thinking this is just one for me and my hubby. I think it’s kind of sad that the people that make these movies know that children love super heroes and yet they insist on having bad language in these movies that they know darn well little children will want to attend. A movie can be very good with all the “bad” words. Thank you im never quite sure about kid movies anymore. It seems like cartoons are a safer bet but then yet not always are same either. So teens who have better discernment and are more established in eho they are and have their oen character its more appropriate for. I know my hub and i like watching kid and teen movies with some more modest adult movies. Thanks. Thanks for the review. You have gotten me excited to see it. I thought it might be a little cheesy but it sounds very entertaining. I guess I will accompany my husband to see this!! I always stay til the lights come back on. Some fun things at the end of movies. It sounds like a good movie. It can be hard to know what is appropriate for kids. It seems so stupid they’d throw in swearing when it could so easily be left out. Not that kids don’t hear it now and then, but it looks like you endorse it when you bring kids somewhere to where it will be. As for the violence, often the same feeling, I just wonder sometimes!! I think my husband and I will be seeing this one solo as I don’t think our 4 year old is quite ready for it yet. Thank you for the review. I did not know if my grandkids could watch it or not. I haves 6 yr old grandson who is so excited about antman so I bought him the comic book because I think he is a little young and he’s getting to understand the story and his summer reading done! Thank you. Always searching for comments on how kid friendly movies actually are. My son also doesn’t like super hero movies mainly because they can be so hard to follow, and for a kid, they just want to see action and a really good, fun and easy to follow story line.